Combining skillful negotiating skills and in-depth market research, we maximize the potential of our clients getting the most for their properties. We utilize the most up-to-date and efficient marketing strategies, and consequently our listed properties benefit from increased visibility and excellent presentation. With a highly ranked and user friendly website, unique and informative flyers and brochures, higher quality photographs and the use of diverse media outlets for advertising, we are able to maximize exposure to the right target audience. It’s important to understand that advertising is only effective if it reaches the right readers, and some larger scale print media get a lot of exposure without reaching the right audience. It’s a common misconception that advertising with mainstream print media will actually produce beneficial results. Instead of arbitrarily advertising in mainstream print media, we provide a more calculated and detailed approach as we focus on targeting specific areas and reaching a specific audience to attract buyers. 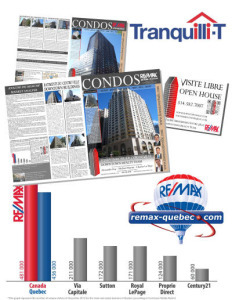 High ranking websites MLS.ca, Realtor.ca, Centris.ca, remax-quebec.com. downtown4sale.com & alexkay.ca get over 1000 visits per month from buyers looking specifically for Downtown Montreal Real Estate. Several similar listings in the area helps us generate more interest for our properties by suggesting our other listing. Part of RE/MAX Action in Westmount. Offices in Downtown Montreal and Westmount. Open House at least once a month in the same area which allows us to send clients from one to the other maximise exposure. Our open houses, listings, offices and marketing all done in the same area so as to promote your property to the same clientele as our other listings. We are aware of the importance of communicating the right information to our clients as well as listening and working according to their specific needs. We believe that this all begins with a high level of professionalism, honesty and integrity. Please feel free to contact us at your convenience for a free evaluation of your property. It would be our pleasure to provide you with a free market evaluation as well as an outline of our unique marketing strategies.